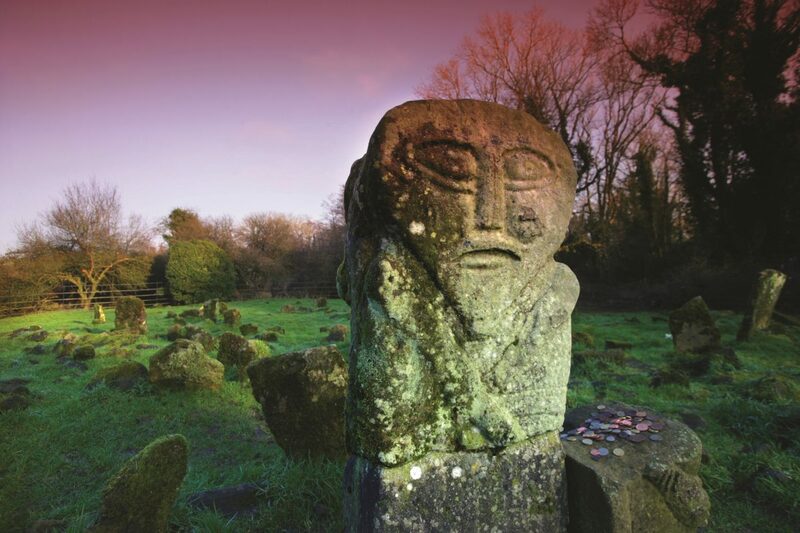 This two-headed stone figure on Boa Island is often called a Janus, after the two-faced Roman god of doorways who gives his name to January – and janitors. There may be no connection, but each generation makes its own meaning, as can be seen by the coins that regularly appear next the figures. New Year is a time for new things, whether listening to great classical music or stretching your singing or writing ability. The turning of a New Year is a time to look both forwards and back. Many of our articles in this issue reflect on other moments that have the same quality. Like the Janus figures they seem to come in pairs. There are many turning points other than the New Year: Halloween features in Catherine Vallely‘s memoir A Galway Halloween, and in Chris Campbell‘s short story Old Arthur (which was read in the Halloween edition of Radio Ulster’s Time of Our Lives). Olive Travers writes about a modern rite of passage in Suiting Up, which has been broadcast on RTE’s Sunday Miscellany, and the revival of a more ancient custom in Room, Room, Room for Mummer’s Rhymes, exploring the tension between violence and neighbourliness. In New Beginnings? Dermot Maguire looks back on the past years and reminds us that there have been such upheavals before. With Annie Proulx in Leitrim he touches on the writer’s sadness at abandoning a dream. The fate of Annie Proulx’s building project may be contrasted with that of Ken Ramsey‘s single Brick, and in The Red Gazelle the same writer captures a single moment in time, insignificant in itself – but unforgettable. A single moment may encapsulate a lifetime – or many lifetimes. John L James‘ poems often seem to manage that. Watch out for his first anthology when it appears. In When a Tree Falls in the Forest he meditates on the death of a giant sequoia felled in the New Year storms. And there are my own two poems on time and change – The Seventh Day and Older than the Rocks. Make of them what you will. Write and let us know what you think. 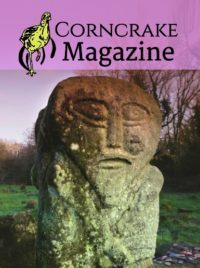 The next Corncrake should be out for Patrick’s Day.